rec. 1984, Brooklyn Academy of Music, New York. I was fortunate to see Einstein on the Beach at the Brooklyn Academy of Music in 1984. That was following the original 1976 production. It was then revived in 1992 and again this year (2012). I have memories of it being an astounding spectacle, memorable for its visual aspects, and for its music. I've owned all recordings of Einstein over the years - from the original LPs on Tomato, to the Sony reissue on CD, to the later Nonesuch recording. I was never satisfied, until recently, when Philip Glass's Orange Mountain Music released a 217-minute recording of the 1984 production, available only by download from Amazon and the iTunes Store. 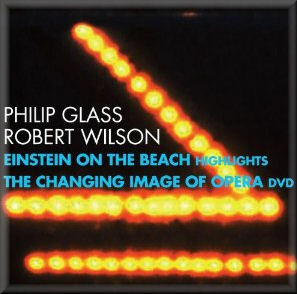 At the same time, Orange Mountain Music released this CD/DVD set, which contains "highlights" of the 1984 recording, together with a DVD, The Changing Image of Opera. I was a bit apprehensive at first at the idea of reducing this long work to a 77-minute highlights disc, especially since the minimalist music of the work can only be fully appreciated as it deploys over time. With this in mind I was pleasantly surprised to hear how well this disc works. It's nothing like the entire opera; it's a summary of the main themes, in 21 tracks, but it does work well as a reduction of Einstein. The recording is excellent - as is the complete recording - and the editing of the highlights is tastefully done. Certainly, if you care about Einstein on the Beach, you need to get the "full" version, but if you care about this work, you also need this set. That 58-minute documentary is well worth the price of admission. There are interviews with Philip Glass and Robert Wilson, but also extensive footage of the 1984 performances - most likely filmed during rehearsals, given the tight shots. There has never been this much film of any Einstein recording before; this documentary was made for PBS and broadcast in 1985, but never before released on video or DVD. Naturally, the 2012 revival was filmed and recorded, and we'll probably see a luxurious Blu-Ray/CD set with plenty of bonuses, backstage footage, making of clips and much more. In the meantime, this is the best way to understand this musical-theater work that truly did change the way people looked at opera and theater. Kirk McElhearn writes about more than just music on his blog Kirkville (http://www.mcelhearn.com).